Just because she can see the dead doesn’t mean Verity Long wants to spend her days hunting ghosts. 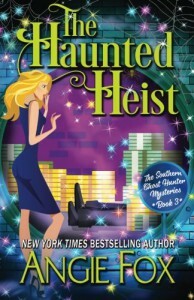 Instead, she’s over the moon to land a marketing job at the local bank…until she finds her new boss dead in the vault. Even her ghost friend, Frankie, knows that's no way to start a career. I didn't expect to like this book, that's why I was putting off reading it. Boy, I was wrong! I really enjoyed it. Almost all the time I was grinning especially when I reached parts about a ghost Frankie. I loved almost all of the characters, because they were so interesting and fearless. Of course there were some parts when I question the decisions that have been made, but, still, it didn't take the joy from reading this book. I didn't read the first two books in the series, but as of right now I'm seriously considering of reading them. It is a great book to relax after a hard day. Definitely recommend it.